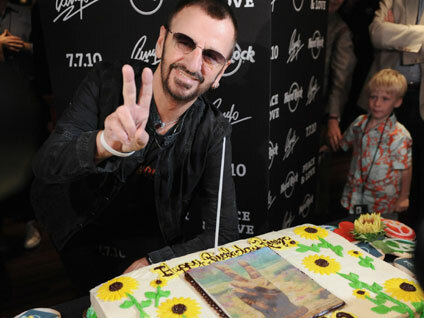 NEW YORK (CBS) Ringo Starr turns 70 on Wednesday, and he doesn't want any presents. Instead, the famous Beatles drummer is making it clear, via his website, that the ideal gift to him would be for everyone to throw up a "peace" sign with their fingers and say aloud, "Peace and Love" right at 12 p.m. on his birthday. Starr first started this tradition when he was in Chicago back in 2008 and hopes to make it an annual ritual. Joining The Beatles in 1962, Starr gained worldwide fame as the group's replacement drummer. He has lent his signature voice to megahits like "Yellow Submarine," "Octupus's Garden" and "With a Little Help from My Friends." Starr will also celebrate the big milestone by performing two shows in New York on Wednesday. In the morning, he will perform at a private event at the Hard Rock Cafe in Time Square and will later perform a concert with his All Starr Band at Radio City Music Hall.